The latest... 27.01.2010. This weekend will not see a major event on the Alster ice, but the colder weather might just make it possible on the weekend of 5th and 6th February. As mentioned, large groups of people are forbidden in one area. The ice is not thick enough yet! The authorities will not allow mulled wine stands around the Alster, only on it, and reportedly only during an official weekend event. Some people are of the opinion that stands around the Alster should be allowed, but how can anyone stop the masses from walking on the ice anyway? If you do go down, it's at your own risk and it is more than bitterly cold! A balaclava and very warm artic clothing is a must, ski-clothing is correct - no thin trousers, or stomach-free fashion clothing or uncovered ears! Two pairs of socks would help. Even dogs could freeze out there, so think carefully before going. I could see one cafe open, but most are closed. Parking is getting close to being impossible, all round the outer-Alster. 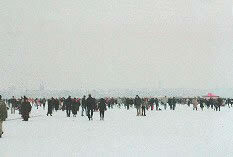 Ice sailing is strictly forbidden. Police are stopping them. 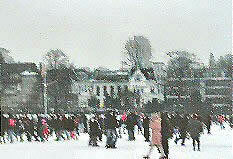 Only certain types of sport are allowed on the Alster, such as dingy sailing and rowing. Wind surfing is forbidden. All motor boats, except the tourist and licenced boats are not allowed. Stay well away from bridges and trees, as the ice is thin. Large gatherings of people are to be avoided, due to weight. Hamburg, 12:00 hrs 27.01.2010 | Today could be the day that the Hamburg authorities give the go-ahead to walk, or skate, officially on the Alster lake near the city centre. This would be first time for 13 years. Our photos from then can be seen in this group or on the website. So far, we have received no intention of a go-ahead from the Senat press department, in the town hall/city hall, but a team is out measuring the ice at circa 50 different points around the lake. A rush to gain licences to sell Glühwein may take place at any minute. The ice has reached the required 20cm in some places, but a thaw is imminent and this may ruin the chances. We need minus temps for the rest of the week. The authorities have quoted a 50-50 chance. 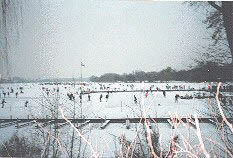 One million people will be on the ice, if the go-ahead is given. 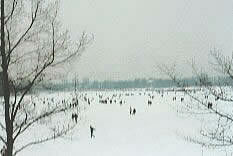 Currently it is not allowed, even though some people are on the ice at this very moment. A group of youths were rescued yesterday from ice which had theatened to break. In 1997, dangerous cracks were discovered, hence the fact that the thickness of the ice has to be 20cm this year and not 15cm. Radio stations are poised to pass the news on and we'll keep an eye on our Emails. As our source of news is the same as the radio stations and TV, watch this space! 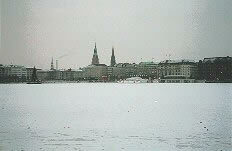 Hamburg 16.01.2010 | Is the Alster going to freeze over and be suitable for skating for the first time since 1997? 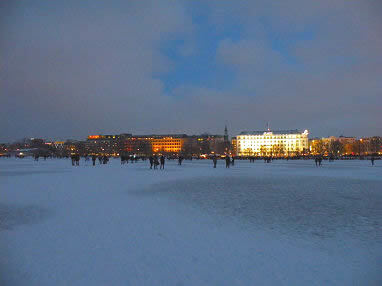 Not all of the Alster will be suitable, as ice blocks create large uneven areas. Usually the area at the opposite end of the Alster to the town centre is cleared, near the Yacht club - click here for map. If the go-ahead is given to walk and skate on the Alster, and the ice reaches a thickness of more than 15cm, a major rush to gain licences to sell mulled wine on the Alster will take place in the relevant authority buildings.